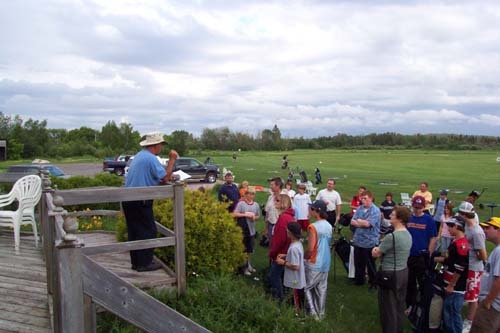 Vic Whissell is shown here providing instruction to the parents and children gathered for the first day of play in the Whistling Winds Junior Golf League which runs every Thursday evening for ten weeks at the nine hole golf course which is part of the Valley Family Golf Centre complex. The Junior League began on Thursday, June 22 and culminates in a year end tournament which will be held on Saturday, August 26, 2006. Boys and girls from as young as 4 years of age up to and including 16 were invited to register with the league for a fee of $65. This fee includes nine holes of golf every week; the year end tournament; prizes and awards; plus helpful instruction on how to play the game. Vic is shown below preparing the scorecard for one of the young participants. 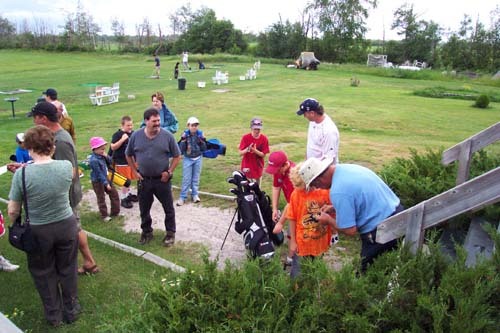 If your child was unable to register for the Junior League, you can still register for the 15th Annual Mini-Masters Junior Golf Tournament will be held at the Valley Family Golf Centre on Regional Road 15 just outside Blezard Valley, on Saturday, August 12, 2006. The tournament is open to all boys and girls from the ages of 4 through 12. It consists of a nine-hole tournament; special skills competitions; a barbeque lunch; prizes and trophies. The action starts at 9:30 a.m. Registration fee for the tournament is only $35. For more information on how you can register your child, call Myrna or Vic at 897-7400. You Could Win 100 Lotto 649 tickets just by subscribing to Valley East Today...Tell Your Friends! Wednesday July 26 2006, 6:30 p.m. you are all invited to come and celebrate the Feast of Ste Anne, Patron of first Nations Peoples organized by First nations, with the Rosary & Mass presided by Father Michael Stogre s.j. at Our Lady of Lourdes Shrine 271 Van Horne Street. Info: Margaret Gordon at 674-2128. Don't Forget To Try Out Your Combinations At Local Business Establishments. It Could Win You A Trip To Cuba! Long Distance Calling???? Interested in Voice Over Internet Technology??? Need Your Computer Repaired??? Patti and Sean Carroll were born and raised in Garson. The 32 year old parents of three young children, shown in the photo above, had decided to renovate their home in Garson when they spotted a number of attractive houses for sale in Valley East. It didn't take them long to spot the potential for the future with respect to the recreational facilities and schools available for their children and at the beginning of July moved into their home in the Elmview area. 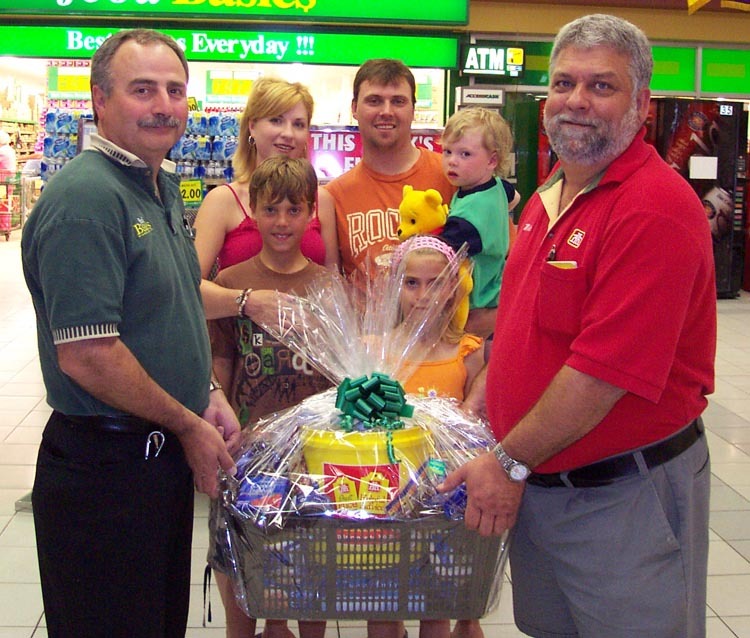 Ken Desjardins, on the left, owner of Desjardins' Food Basics, and Mike Lemieux, on the far right, owner of Hanmer Home Hardware, presented the Carroll Family with a "Welcome Home Gift Basket", a special initiative just introduced by the two merchants to welcome people who purchase new homes or who settle into apartments in the communities of Valley East and Capreol. The Carrolls were the first recipients of the "Welcome Home Gift Basket". Two other couples, one from Mississauga and one from Alberta, were to receive theirs the following day. While the gift basket may only contain a little better than $100 worth of helpful products, the Carrolls were thrilled to have been welcomed in such a warm manner. "We are so glad we moved here," exclaimed Patti. "We just can't believe how friendly everyone has been. Our children have already made new friends and they just love it here." Sean, who works for the City of Greater Sudbury as a Fire Fighter at the Airport, commented, "The thing that we are most impressed with are the facilities in this town. Where we live now we can walk to the Howard Armstrong Recreation Centre, the Library and the Hanmer Valley Shopping Centre. Now, with a Canadian Tire coming in and places like Hanmer Home Hardware, Desjardins' Food Basics, the Hart Department Store and all of the other stores and services so close, it wasn't hard to decide. It's just as close to go to work as it was from Garson and I am going to be a Volunteer Fire Fighter at the Val Therese Station #16." Sean is shown in the photo holding their youngest child, 3-year old Ben. Standing behind the basket are Ryan (10) and his sister Emma (8). The children will be attending Redwood Acres Public School in the fall. The Carrolls are quite typical of young families who are choosing to live in Valley East. The community is large enough to provide a wide range of recreational and commercial facilities, and yet still retains that special community spirit that adds to the quality of life. As for anyone moving into the communities of Valley East and/or Capreol on or after July 1, 2006, don't forget to stop in and pick up your FREE WELCOME HOME GIFT BASKET from Hanmer Home Hardware in the Hanmer Valley Shopping Centre. Just ask to see Mike. The "Keep The Spirit Alive Contest" was only introduced to the community a week ago, but already it is picking up momentum as residents not only like the idea of winning valuable prizes, but they also are thrilled about the fact that they can do their small part to help improve the overall community spirit in Valley East and Capreol. Three community-minded local businessmen have teamed up to begin a “Keep The Spirit Alive Campaign” and they are inviting all residents to help them spread the message that Valley East is a great place in which to live! 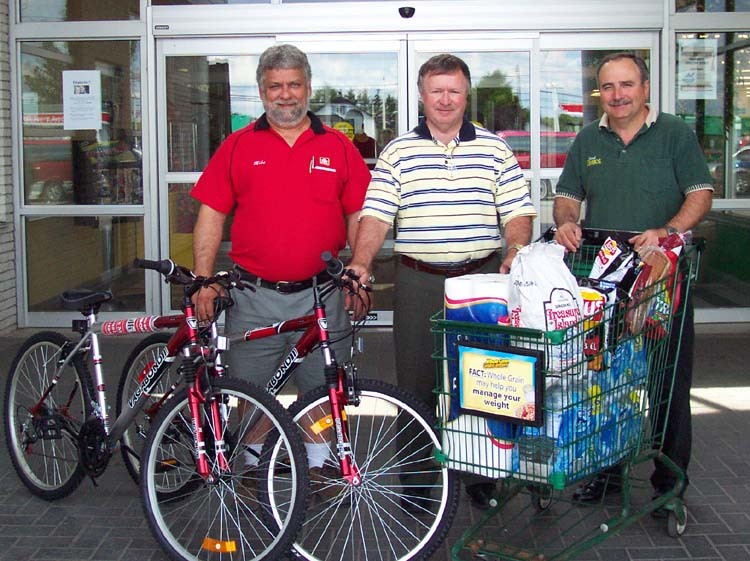 From left to right in the photo: Mike Lemieux, owner of Hanmer Home Hardware, Robert Kirwan, Publisher of the Valley East Today Community Web Site, and Ken Desjardins of Desjardins’ Food Basics announced the launch of the campaign during a press conference which was held at the Hanmer Valley Shopping Centre last week. In order to help get this message out to the rest of the “world” the people of Valley East are being asked to take part in a massive communication strategy using the power of the internet. Everyone participating in this campaign will have a chance to win a “Grand Prize” consisting of 100 Lotto 649 tickets for the New Year’s Eve Draw on December 31, 2006 . What a way to celebrate the New Year by winning the big prize with one of those tickets! Runners up will receive other valuable prizes, including “two” mountain bikes donated by Hanmer Home Hardware, $300 in groceries from Desjardins’ Food Basics, More prizes from other local merchants which will be announced in the coming weeks, including a $150 gift certificate on any flooring purchase from Fantastic Floors in Val Caron. In order to qualify for these prizes, all you have to do is register to receive the Valley East Today Weekly Online News Magazine. Every month from July until the end of December, ten names will be drawn at random from all of the people registered to receive the publication. Those ten people will qualify for our final draw which will be held on Christmas Eve. The winners will be announced in the December 26 issue of Valley East Today! Once you register, the Valley East Today Online Weekly News Magazine, which is currently being received by over 2000 people, will be sent directly to your email address every Tuesday. Not only will you qualify to win the 100 Lotto 649 tickets or other runner up prizes, but more importantly, you can help us “Keep the Spirit Alive” by forwarding Valley East Today to everyone on your own personal mailing list. By using the power of the internet, we can let tens of thousands of people know about Valley East every week. The names of the above people who are already subscribed to the Valley East Today Online Weekly News Magazine will be entered as finalists in the contest. The sooner you register, the more chances you have of being selected as one of the ten monthly finalists. On December 24, 2006, one person will win 100 Lotto 649 tickets, while runners up will win other valuable prizes. Make sure your friends all enter the contest and help us "Keep the Spirit Alive". ARE YOU RECEIVING VALLEY EAST TODAY EVERY WEEK? YOU QUALIFY FOR THE CONTEST! Masciangelo Motors has been running a special "Pick of the Month" feature on their web site for the past five months, and it is turning into quite a display of vehicles. If anyone wants to see a good cross section of the variety of vehicles that area available on the lot at Masciangelo Motors, which is now located on Falconbridge Hwy just across from Madison Avenue, just take a look at the web site. For example, Ron Masciangelo's Pick of the Month for July is this beautiful 1969 Chevelle SS 396 hp. It has a 4-speed transmission and is a Canadian car that has been in storage since 1980. All documentation is available for the vehicle to authenticate its history and features. The original asking price was $49,000, but for the month of July, Ron is giving it away for only $39,000. There are numerous automobiles and trucks posted on line for your viewing. If you want a close up look, just drop in and see Ron, Jeff, Tim or Jennifer. Better yet, go the link below and take a tour right from your computer. A good source has told Valley East Today that the Roger's Cell Tower should be operational by the end of the summer. Apparently the company has been having difficulties with the contractor and this has put the project behind schedule. "The 'Welcome Home Gift Basket' Is Our Way of Saying Thank You For Choosing Valley East As A Place To Live"
What Happened To The Playground Equipment At Valley Acres Playground?